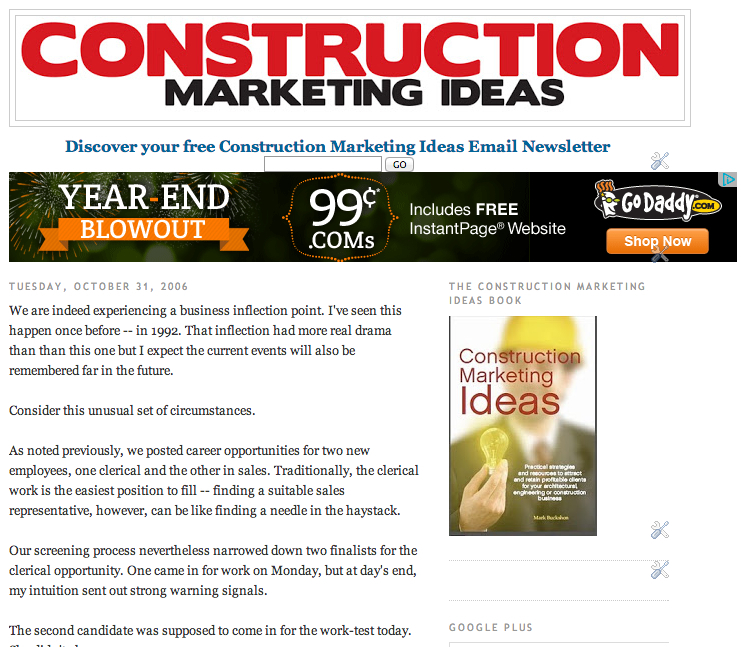 The Construction Marketing Ideas blog started in 2006-07, at the height of a business crisis. A U.S. expansion had failed. The business, which had grown from simple beginnings publishing Ottawa Construction News in 1989, had expanded with publications in Toronto, Washington, D.C., Baltimore, Atlanta and Charlotte, North Carolina. However, in growing the business, we had poorly co-ordinated systems and (most crucially) had lost touch with the most important requirement for sustainable business success: Genuine respect and concern for our clients. At the “peak” of the U.S. business, most of our revenue resulted from special features and company profiles, where we would sell advertising based on supplier-chain relationships with the profiled company or organization. This sales and business model, gleaned from the late Walt Haily’s “Breaking the No Barrier”, is powerful and effective if properly applied. However, it can be abused, and without management controls, individual advertisers might feel pressured or obligated to “support” their business clients — without receiving real value for their advertising investment. Advertisers rebelled. Sales slumped.The business entered a death spiral. Then, just as things appeared to hit rock bottom — the business had just one part-time employee at the bottom — we discovered the solution to the problem. We decided to provide a guarantee of absolute value to every client, no matter how small, and treat every advertiser with 100 per cent respect. The challenge in fulfilling this commitment: Advertising is an art as well as a science. One-time “client support” advertisements may be effective in reinforcing business relationships, but do these advertisements provide real value to the individual advertiser — and what happens if the advertiser feels a sense of coercion or obligation to participate? Our answer: We would ensure that absolutely NO advertiser should feel any pressure to participate. A “no” is just that. As well, we would deliver enough marketing knowledge and insights to make it possible for every advertiser to achieve a genuine return on investment. 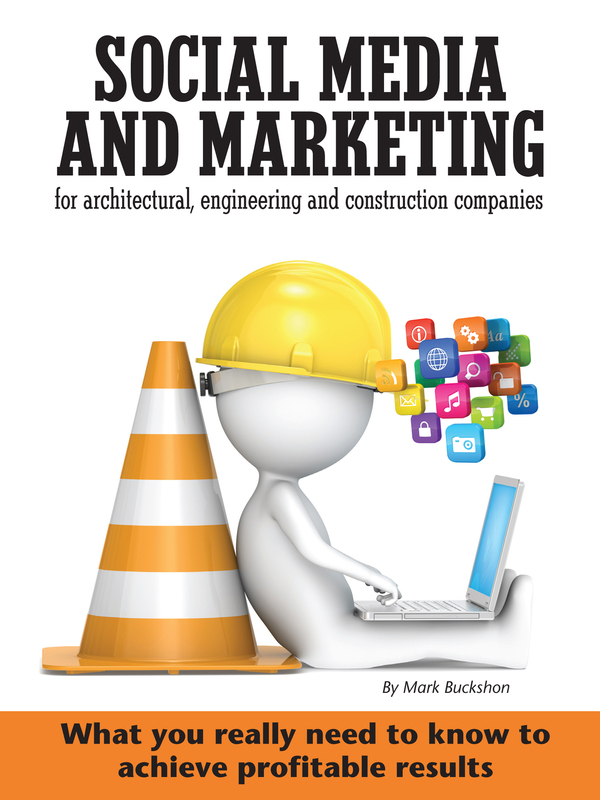 Construction News and Report Group president Mark Buckshon set out to learn everything he could about marketing for the architectural, engineering and construction community. He joined the Society for Marketing Professional Services (smps.org) and achieved CPSM (Certified Professional Service Marketer) designation. He started the Construction Marketing ideas blog, and interviewed and researched best practices for marketing in the AEC community, culminating in the 2010 publication of Construction Marketing Ideas: Practical strategies and resources to attract and retain clients for your architectural, engineering or construction business. In 2012, he followed up with Social media and marketing for architectural, engineering and construction companies: What you really need to know to achieve profitable results. The result: The business has thrived and grown. If you are interested in a publishing or sales career with the Construction News and Report Group, see www.adsalessuccess.com. If you would like more information about advertising in any of our publications, visit the relevant publications websites (you can find a list of them on this blog’s home page). If you would like to speak or meet with Mark Buckshon, email buckshon@cnrgp.com, phone (888) 627-8717 ext 224 or visit the contact page to set up your own 30-minute free video or phone conversation.